The first half of 2013 has kept us quite busy. 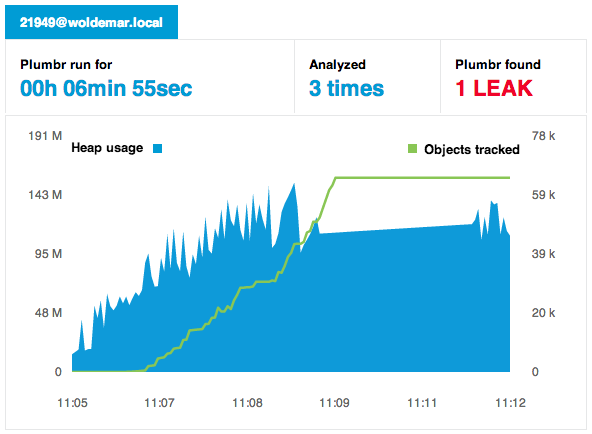 I’m happy to announce that today we are ready to release the first significant result of our work – Plumbr version 3.0. What has changed? The most visible changes are related to usability. Before 3.0, Plumbr was packaged as a desktop/server software that you needed to install on every workstation separately and the user interface (UI) was limited to that workstation. We knew this was sub-optimal, but that was a result of our conscious decision – we wanted to concentrate on creating the detection algorithm first. When we realized that we had managed to create the best memory leak detector in the world, and when hundreds of users used the product in their real production and testing environments, we knew that it was high time to let the UI part catch up. Customer interviews hinted that a common dashboard combining all the information Plumbr collects and creates would be in order. And that’s exactly what we release today: from today on, Plumbr is offered as a Software-as-a-Servise (SaaS) solution. This means that all your JVMs, performance metrics and leak reports are now gathered in one easily accessible place. Create an account at portal.plumbr.io and enjoy. And let us know how you like it! Isn’t it cool? We’ll explain why and how we do it in a month. Follow us in twitter to be among the first ones to know! When we look further into future, we have even more important things brewing in our research labs. Let me explain: during the past year we have constantly improved Plumbr leak detection precision. In order to achieve this, we have configured all free Plumbr installations to send us unobtrusive statistics about memory usage of applications Plumbr is attached to. We’ve collected more than a million data points (growing fast), and used data mining and machine learning techniques to better detect trends in application memory usage that hint memory leaks. We can apply the same approach and expand our detection algorithm to also detect other performance – related problems. We are working hard to launch new results as soon as we are happy with the precision of the new algorithms. 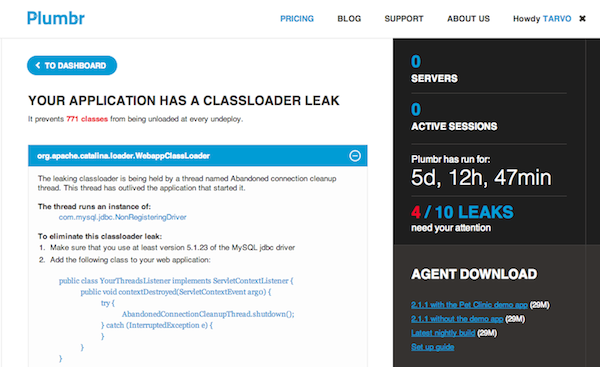 Until then, if you are not already using Plumbr, I’d suggest you start doing that. If you buy a subscription now, you’ll get all the future improvements without extra cost as soon as they are launched (or earlier – we sometimes ask our more active users give feedback on new features before official launch). Want to join now? Go to portal.plumbr.io.